Laser hair removal is the process of removing unwanted hair by exposing the hair follicle to pulses of laser light. The laser’s light is attracted to colour (melanin) in the hair, and uses heat to destroy the hair follicle and it’s blood supply, while at the same time protecting the surrounding tissue. For this reason, the more contrast between the colour of the skin and the colour of the hair (dark hair/light skin), the more effective the treatment. If anyone has ever told you that Laser Hair Removal is permanent and can be done in one treatment … they are lying to you! It takes an average of 6 treatments. Also, due to hormones and aging, not every hair can be destroyed. Each hair grows in 3 different phases, therefore multiple treatments are required to destroy every follicle. After the desired level of hair reduction is achieved, maintenance treatments are often needed once or twice per year, depending on the area. The Vikini is the next generation in laser hair removal. It delivers a rapid train of pulsed diode laser light at an 808nm wavelength; which has been proven to be optimal for laser hair removal. This allows for fast, effective, and comfortable results. The Vikini uses a continuous motion technique combined with rapid pulse repetition to create a shorter session time for patients. With the Vikini, you can treat a man’s back in under 10 minutes! Treatments are safer and more comfortable thanks to the integrated sapphire cooling tip. The customizable settings, including power and pulse modes, makes the Vikini safe and effective for a wide range of skin and hair types. This dynamic diode laser hair removal system is the perfect performance-oriented solution for your laser hair removal needs! 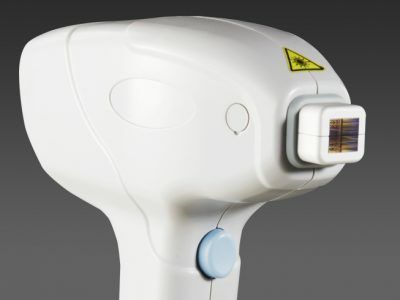 An Intense Pulsed Light (IPL) machine is not a laser. It has filtered light at a certain wavelength which imitates a laser. The IPL may effectively irritate the hair but will not destroy the hair follicle like a laser can. You will see more permanent hair reduction with a diode laser because it not only targets the hair follicle, but the blood supply to the hair follicle as well. Who should refrain from laser hair removal? Ladies, do not book your appointment when you are on your period, as this will make everything feel more painful! *Note: You may use a topical anesthetic cream 30-60 minutes before the treatment, but most clients find it unnecessary with this laser. The Brazilian treatment area is where numbing cream is most commonly used. Zensa may be purchased from LA Laser & Spa ahead of time. Do not shave until the skin has completely gone back to normal. The treated hairs will fall out in about a month. *Note: Please call LA Laser & Spa at 780-232-0965 immediately if you have any complications!